South Shields team photo ahead of the game against Southampton on Saturday. Southampton underlined their reputation as one of the country’s top academies by sweeping their way to the inaugural South Shields FC International Tournament title over the weekend. 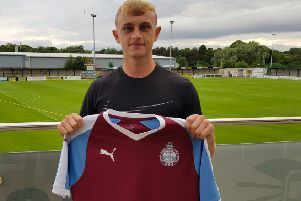 The Saints competed with hosts South Shields, Celtic and Marseille in a three-day festival of football at Mariners Park as top talent from across the continent was put on show. Southampton ultimately had too much for their competitors, beating Shields 3-0 in Saturday’s semi-final before overcoming Marseille 2-0 in the final. The Mariners were beaten 2-1 by Celtic in the third-place play-off, but were left to reflect on plenty of positives after a weekend which saw them come up against two impressive Under-23s sides. The tournament got underway on Friday, with Marseille taking on Celtic. The match was abandoned after 69 minutes with the score standing at 1-0 to the French side, whose goal was scored by Zacharie Iscaye. A thunderstorm forced the game’s abandonment as the officials took the players off the pitch for their own safety. It was decided that the result would stand at 1-0, and so Marseille progressed to the final. Hosts Shields made their bow in the tournament on Saturday, and made a bright start against Southampton. The Mariners enjoyed good possession for much of the encounter, but the Saints’ ruthlessness in the final third ultimately proved to be the difference. Jake Hesketh – who has made several appearances for the club’s first-team – was the star of the show. He opened the scoring on 27 minutes after Southampton won the ball in the Shields half and the ball was played to him outside the box on the left. Hesketh skipped past one challenge and worked his way into a shooting position before rifling an effort into the top corner. He was clinical again seven minutes before the break as he doubled Southampton’s advantage, picking out the bottom corner with a superb effort from 20 yards. The Mariners battled to get back into it and started the second half brightly, with Matty Pattison at the heart of their attempted fightback. 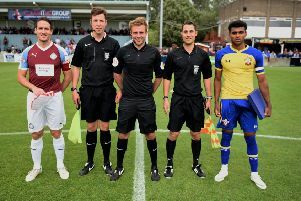 However, Southampton started to regain the upper hand and after Callum Slattery hit the bar, they were awarded a controversial penalty when Barrie Smith was adjudged to have fouled Marcus Barnes. Barnes picked himself up to rattle the spot-kick down the middle and seal Southampton’s place in the final. The result meant Shields would contest the third-place play-off with Celtic on Sunday. Lee Picton and Graham Fenton’s side enjoyed an impressive first half, and deservedly went in at half-time leading 1-0. They took the lead thanks to a wonderful finish from Pattison as he guided a corner from Michael Richardson into the corner of the net. Celtic came out for the second half with renewed vigour, and were awarded a penalty in the 48th minute when the referee blew for a foul by Gary Brown. Leo Mazis converted the spot-kick and an entertaining contest ensued. Shields twice went close to going back in front, with Richardson shooting wide from a Pattison corner and academy midfielder Lewis Orrell crashing an effort against the crossbar from the edge of the box. However, it was Celtic who struck the decisive blow on 62 minutes when the ball was worked to Grant Savoury on the left of the box, and he finished low past Liam Connell in the Shields goal. Brown had a header ruled out for offside and Michael Colquhoun was denied by a fine save as the Mariners tried to get back on level terms. However, there were no further goals as Celtic claimed third place. Southampton deservedly clinched the trophy with a 2-0 victory over Marseille in the final. Slattery opened the scoring in the fifth minute with a terrific strike from 25 yards, and the Saints had several opportunities to go further ahead. Chief among them was a penalty by Barnes, but he blazed it high over the bar as Marseille breathed a sigh of relief. It was to prove a temporary respite, though, as Southampton wrapped things up soon after when Michael Obafemi clinically finished from just outside the area. The Saints had done enough to claim the title.